Snowy Owl, St Davids Head. I arrived at Whitesands about 8.45 am and began the walk across to St Davids Head. After about half a mile I met a birder coming the other way. It was Mike Young-Powell, a local man whose patch I knew St Davids Head was. Obviously excited, he borrowed my phone to get the news out. He had seen the bird on a rocky outcrop just a few minutes previously. I headed back with him to relocate it, and it suddenly took flight from maybe twenty yards away from us. For such a large white creature it could be surprisingly inconspicuous. I soon got to a point on the other side of the valley where the light was better and began to creep closer, stage by stage. The owl clearly knew I was there but didn’t seem at all anxious. At each point I watched her for a few minutes and took a few pictures. I peeped over a clump of brambles and bracken, and just watched. It was quite an intimate moment, and I felt truly honoured to be in her presence. She seemed quite relaxed, blinking in the sunshine and looking around from time to time. When closed her eyes looked like little smiley black slits in a round white face. Talk about inscrutable! There was something about a sumo wrestler about it. Much too soon, however, my presence became too much and she flew off. I expected some flack from the other birders when I returned to the path but they were fine. Continuing up valley I rounded a corner and the owl exploded away from her perch on the ground about twenty yards away. She flew some distance and landed on a rock, where she was harrased angrily by a raven and chased back towards us. She landed on the hillside opposite, about half way up Carn Llidi, much too far away for a binocular user like myself. From this distance and with only 10×40’s, she appeared grey all over with a white face. I settled down and waited for her to make a move. Seven hours later she was still there. During that time she shifted around a bit, and those with a scope would have found the minor details of her resting period fascinating, I’m sure. For me the most interesting thing was the behaviour of two ravens. One made a sudden right angle turn and flew over to the owl, landing briefly on a rock about ten yards away. Another inspected the owl carefully from above. Neither of them could ever have seen a snowy owl before, and probably didn’t know what to make of it. Perhaps the owl was too near to the nest of the angry bird mentioned earlier. Eventually I got too cold to wait around any longer and drove home. I downloaded the pictures into Lightroom yesterday and found to my relief that one of the closest pics was sharp. I cloned out two grass stems which fell across the birds face, and cropped the image fairly drastically for the above portrait. The quality at 100% is still pretty impressive! It is noticeable how brown the barring is on its upper breast compared to that on its crown. The afternoon had been pretty frustrating, but what a morning! This has to be one of the most amazing birds I have ever seen. PS : Many thanks to Alastair and Jill Proud for the sandwich and Welsh cakes…..
To follow Tales from Wild Wales please scroll down to the bottom and click Follow. 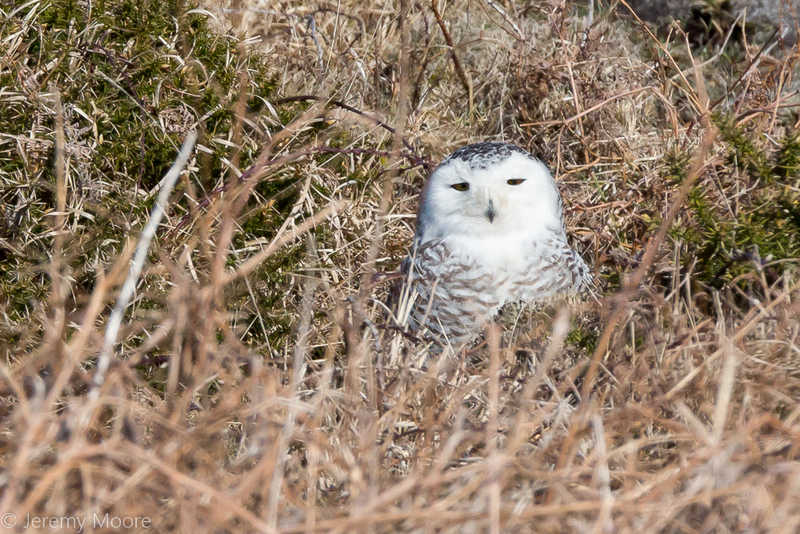 This entry was posted in Uncategorized and tagged bird, owl, Pembrokeshire, photography, snowy, st davids head. Bookmark the permalink. Dammit …….. you’ve done it AGAIN! Tried sleuthing one in Cornwall a while back but was unsuccessful. Must be an amazing creature to see in the wild …… or anywhere, come to that Good to do a twitch occasionally, then! Having described myself as the world’s worst twitcher, it does make a nice change when things work out that well. The bird was seen yesterday about half a mile off New Quay, heading north, so who knows where it will turn up next. Are you free at all next week? I’m planning to head east……..